Our bedroom balcony this morning, on a beautiful fall day. I’ve been fighting a cold all week and have been indoors for the last three days, inhaling camomile steam and drinking my home-made ginger-lemon-honey brew, sleeping, resting, working, and watching movies on Netflix with our temporary house guest and friend Catherine, who is also sick. It’s been actually kind of cosy being sick together. Even though she probably gave me this cold. She even admits to it, although one never knows where the germs come from. 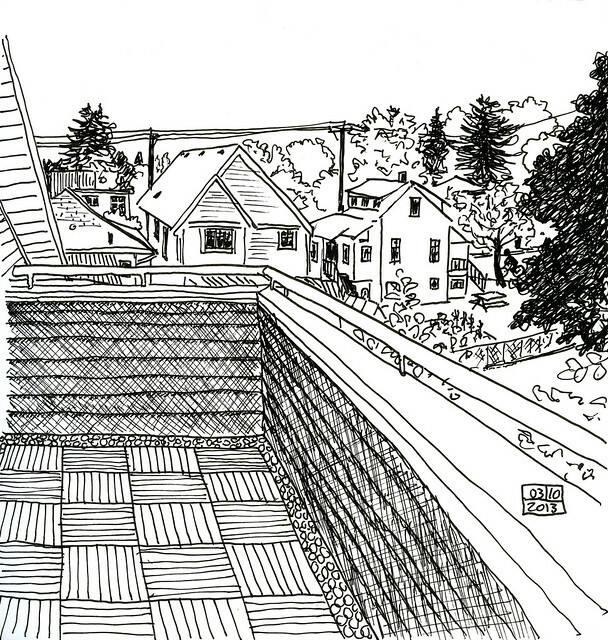 But today is a sunny day, I did this drawing on our balcony, and Cath and I are going for a walk. Cold, be gone already!